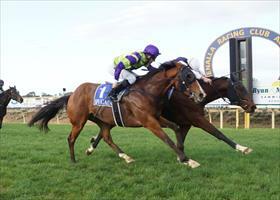 Ultra consistent gelding One Inch Punch is becoming a stable favourite in Danny O'Brien's yard after another tough victory at Benalla on Monday. The Teofilo four-year-old had to claim this win in the stewards room after significant interference in the final 200m, but O'Brien said it was a testament to the horse's attitude that he finished close enough to gain the protest. "Given he was carrying 60kgs and was seven weeks between runs, he was entitled to wilt when he copped the interference, but he dug deep to keep coming and he would have won clearly with a free run," O'Brien said. "This horse is just so genuine, ever time we have taken him to the races he puts in and gives his all which is all you can ask." One Inch Punch has had eight starts since joining O'Brien's stable for three wins, three placings, a fourth and a fifth. "He has the ability to keep working through his classes and we will look to place him to advantage to see if he can string a few more wins together to close out the season," O'Brien said.